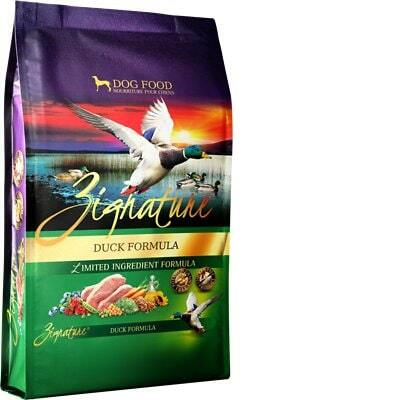 Zignature Duck Limited Ingredient Formula is a mid-priced dog food with exceptional quality. This product has no controversial ingredients, including no artificial preservatives, colors or flavors. However, It has a high amount of carbs, compared to its protein and fat, but the meat and fat quality is excellent. Zignature has a below-average number of recalls compared to other dog food brands and was very transparent when answering our questions. Watchdog Labs highly recommends this product. The average dog food we reviewed has 39 total ingredients, with 1 controversial ingredient. This product has 0 controversial ingredients in the food, perfect. Duck is a waterfowl and generally a healthy dog food ingredient that provides nutrients like protein, fat, iron, zinc, B vitamins, potassium and phosphorous. Raw meat contains about 75% water which is cooked off during the making of dog food. This leaves only a fraction of the protein content in the final product's weight. We recommend looking for dog foods that also include meat meals in the first five ingredients (pre-cooked meat powder that contains four times the amount of protein). Duck meal is a healthy dog food ingredient that provides nutrients like protein, fat, iron, zinc, and B vitamins. Meat meals are the result of cooking. Water is removed from meats to create a protein-rich meal powder. Meat meals contain about four times the protein meats do, so generally, they're a good source of nutrients. Duck is generally a healthy dog food ingredient. Pea flour is produced by heating or roasting peas. This allows for greater nutritional value because it gives greater biological access to protein and starch. Peas are a good source of carbs, fiber and protein. Peas are starchy but high in vitamin A, vitamin B6, vitamin C, vitamin K, phosphorus, magnesium, copper, iron, and zinc. We consider this a healthy dog food ingredient. The U.S. Food and Drug Administration (FDA) has warned that there is a potential link between peas and canine heart disease. It is still too early to draw conclusions so we cannot yet say if peas are a generally high-quality dog food ingredient or should be avoided. No controversial ingredients were found in Zignature Duck Limited Ingredient Formula - this is excellent. Zignature Duck Limited Ingredient Formula is made in the USA, that’s great because of the rules and regulations that exist in the United States. The meats and added oils in this dog food are clearly shown on the food label. We see Duck, Duck Meal, and Sunflower Oil as major sources of protein and fat. It’s great when dog foods specify which species the ingredients come from. 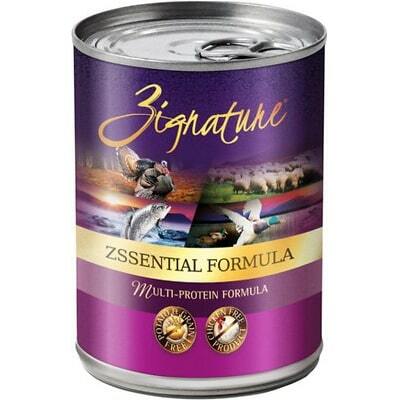 Zignature Duck Limited Ingredient Formula includes no artificial colors. Just like for artificial preservatives and colors, this product also does well when it comes to artificial flavors. That means it doesn’t include them at all. Fantastic! Zignature has a below-average number of recalls compared to other dog food brands. Zignature is owned by Pet Global and did not respond to the first email, but they did respond to the second email that was sent one week later. After one additional follow up email they completely answered all questions. use regulatory experts and nutritionists. Gary Crosslin, PhD, Nathan Thomas, David Pere. Dr. David Dzanis, DVM, PhD, Contracted Regulatory Expert. Knowing who the specific professionals are working on the product is very insightful and inspires confidence in the product and brand. All of our diets are formulated with the full support of BSM Partners. Credentials include Master Degree in food service, Organic Chemistry, PhD, Animal Nutritionist, & DVM's. Our diets are tested by both, nutrient profiles by formulation and by analysis of the finished product. Yes, we do the AAFCO feeding trials. The first response felt too generic and could have meant anything. We asked for clarification and the follow-up email was very specific. You would need to contact the manufacturing facility directly in regards to visiting the facility. Not a very detailed answer, but it does provide some insight. Our dry recipes are manufactured with our partners in Perham & Brainerd Minnesota. Our canned formulas are manufactured with our partners in Mitchell, South Dakota. None of our ingredients come from China.